When I was given the chance to review this book, I immediately accepted! My husband and I both love to give whenever possible, so I couldn’t wait to see what this book offered. I came away with a greater determination to give whenever possible and to encourage others to live a generous life. I Like Giving: The Transforming Power of a Generous Life alternates between powerful true stories of creative giving and lessons that discuss how giving affects us and those around us, whether we realize it or not. It is filled with practical ideas of how you can live a generous life – and not all of them involve money! 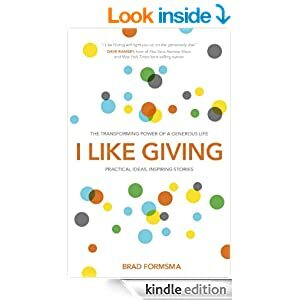 Among other things, the author emphasizes that giving is something that you get to do, not something that you have to do. He also talks about how to raise kids who have a sensitivity to meeting the needs of others – and as a soon-to-be parent, I especially loved those lessons! Before we became givers, our lives were pretty empty. We were living the American Dream and were good at it, but it turned out to be more of a nightmare than a dream. Ultimately, it was superficial. When your life is just about your next restaurant dinner, the next remodeling project, or the next lifestyle upgrade, it’s not that rich. Sure, money can buy things, but money can’t buy joy. Joy doesn’t come from filling your life with stuff. Joy comes from giving your life away (p. 20). …what we’ve learned has convinced us that giving is absolutely essential to life. If you’re not experiencing happiness and satisfaction in your life, giving to others could be the one thing that turns that around. Not only does it result in a healthier, happier you, but it creates a better world for all of us. Because here’s the problem: we live in a world that sends us mixed messages. On one hand, we’re told to work hard and compete and position ourselves in a fast-moving work environment so we can make as much money as possible and get ahead. On the other hand, we sit in churches or go to fund-raisers where we are asked to be generous. We are bombarded with billboards that tell us we need to be less selfish, that we need to give back or feel guilty about how many people live on less than one dollar a day. If we’re not careful, we find ourselves in a lose-lose situation. I believe there’s another way – a better way. Living generously is about giving your life to other people so that everything you do – whether it is your work, your charitable giving, or your contribution to your neighborhood – becomes both a gift to others and rewarding for yourself (pp. 24-25). If you feel like something is missing in your life, I’d encourage you to pick up this book and give a generous lifestyle a try. If you already love to give, this book will renew that love of giving and provide you with even more ideas for how to serve others! You can read chapter one here! I received a copy of this book from Waterbrook Press in exchange for my honest review. ← First Pregnancy: 37 Weeks!